VISIBILITY • The low back wall design allows the operator to easily see the asphalt hopper, truck position and front mainframe region when paving. 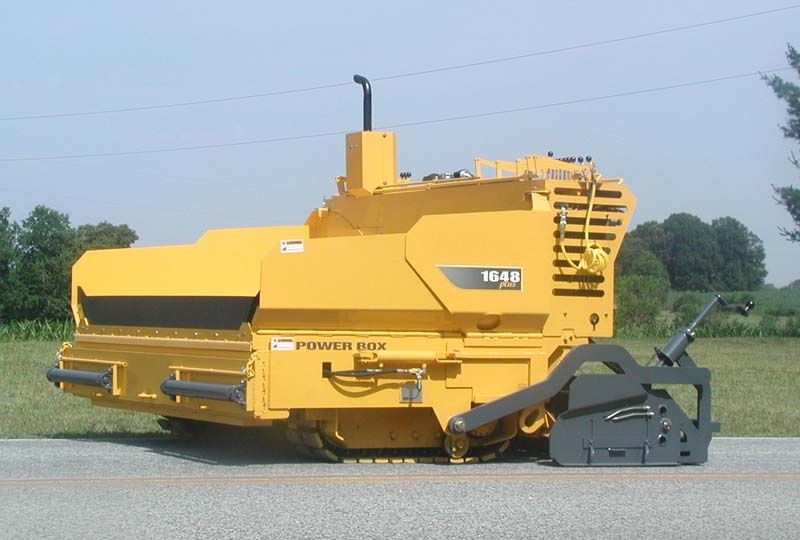 • The 1648 Plus model has a height of 57” • Competitive machines do not offer this type of visibility. NARROW MACHINE WIDTH • Fold-up hopper wings result in an overall width of 8’6” making transportation more economical and efficient. 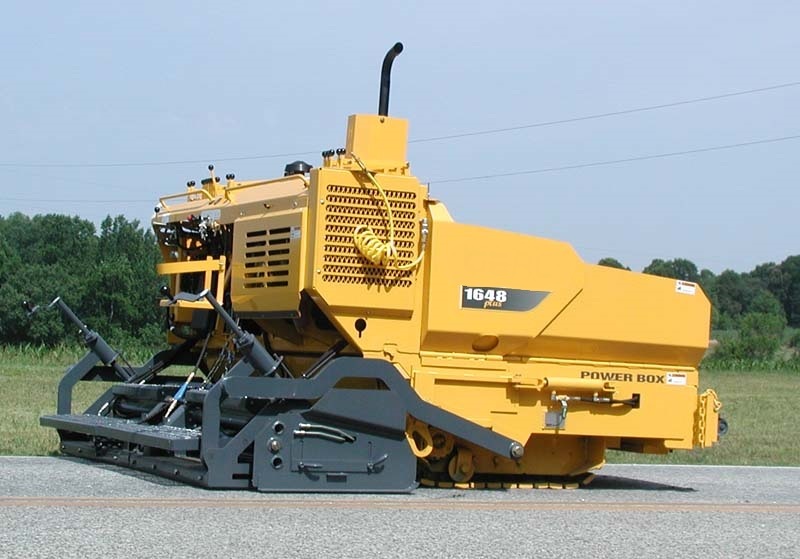 • The short machine width requires less trailer space, allowing more room for additional equipment like an asphalt roller. ASPHALT HOPPER FRONT LIP • Retains asphalt within the paver’s hopper assembly as the truck unloads and pulls away. • This protects the ground drive system from undue contamination and produces a more even finished mat. SCREED • Full-floating, adjustable, vibratory and heated screeds are standard on the Power Box Series. • The 8’ width and 13” length of the main screed provides a solid foundation for smooth, accurate, finished asphalt mats. • Crown, invert and pitch adjustments are provided through screw-type jacks located at the center and ends of the main screed assembly. • These adjustments allow the operator to maintain a consistent depth and develop drainage contours with the mat. • A propane burner system, standard on the 1648 Plus, provides heat to the screed. • This preheating function is required to prevent asphalt from bonding to the screed’s wear plat and scoring the mat finish. MATERIAL AUGER SYSTEM • On the 1648 Plus model, the auger system can be ordered from the factory either mounted to the screed extensions or to the material shut-off gates, depending on customer preference and asphalt conditions. MATERIAL SHUT-OFF GATES • Box-constructed material shut-off gates add extra strength and reliability to a very demanding area of the paver design. • Cylinder attachment point designed for excellent durability and reliability. GROUND DRIVE • Direct-drive type track design that will not slip under normal /severe conditions. This provides the customer more versatility in different sub-base conditions. • This system self-cleans and tensions itself with the aid of a hydraulic cylinder. Track pads are made from cast steel providing the customer both durability and reliability over many years. HYDROSTATIC DRIVE SYSTEM • All Gehl Power Box pavers have a variable hydrostatic pump design that provides smooth acceleration. • infinite control of the hydraulic track motors or wheel motors standard on the 1648 Plus. • The smooth acceleration and infinite settings give the customer good mat thickness and consistency..
SERVICEABILITY • With engine access from both sides, servicing the entire engine assembly is made more efficient. • With the engine access panel removed, access to the alternator and starter is unobstructed. Other manufacturers require the engine assembly to be totally removed. • Engine can be serviced from both sides, and provides easy access to hoses and other components for simple maintenance. Wash-Down Stations Dual Nozzle, 5.5 gal.